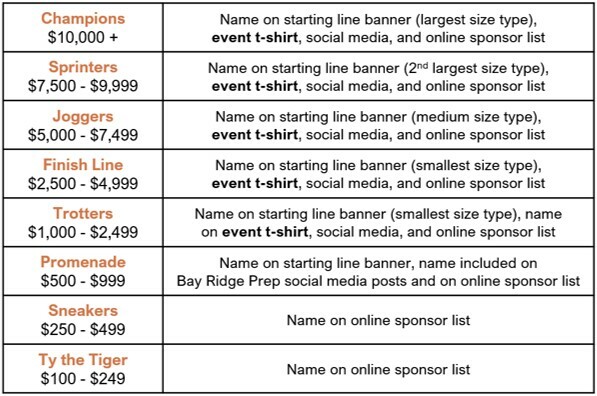 The annual Tiger Trot, the largest fundraising event hosted by Bay Ridge Prep, is supported by a wide range of community members: current parents, parents of alumni, local businesses, alumni, board members, grandparents, and friends. Event sponsorship donations to the Tiger Trot are unrestricted financial support for the current operating budget and have an immediate impact on the day-to-day vibrancy of the school. The Tiger Trot is the cornerstone of Bay Ridge Prep’s fundraising efforts. In recent years, Tiger Trot donations helped renovate the Lower and Middle School auditorium, built a fine art and dance annex space for Upper School students, and supported enhancements to our academic programs and extra-curricular programs. This year the Trot proceeds will help fund improvements to our facility this summer at the Lower and Middle School, as well as provide professional growth opportunities to Bay Ridge Prep faculty, enabling the school to attract, retain, and develop talented teachers. Bay Ridge Preparatory is a 501(c)3 non-profit. The school's EIN number is 11-3444169. Contributions to the school are tax deductible as allowed by law. Please sign up as a sponsor by April 16, 2019 if you would like your name or business logo to appear on the 2019 Trot t-shirt. Sponsors at the Trotter level ($1,000) and above will appear on over 725 Trot t-shirts. All sponsors at the Ty the Tiger and above will be included in a press release. Have a question? Please contact Regan Murphy, Director of Development, at rmurphy@bayridgeprep.org or call (718) 833-9090.